For exquisitely presented French-Euro dishes, this destination restaurant reliably delivers: Though the tasting menu may change, it has held the distinction of two Michelin stars since 1974. The over-the-top throwback decor by architect Stephan Braunfels — walls aglow in red — remains just as iconic as ever. The largest room in this beer hall–style venue was once a stable for horses that pulled brewery carts through Munich. Today, servers in traditional Bavarian garb deliver beer steins and hearty regional dishes, such as pork knuckle (schweinshaxe) and roast duck (bauernente). Order the mixed pan of roast meats if you can’t choose just one. In a region famous for its meaty culinary heritage, Gratitude sets itself apart with organic, plant-based dishes. The menu is ever-changing, eclectic and globally inspired (think hummus topped with sprouts and falafel, and Asian-style eggplant stew over rice). This small, sombre-grey bar may appear unassuming, but it’s crowded for a reason. The drinks stand out for the creative recipes and embellishments: garnishes of fresh herbs, fruits and flowers. Try a G&T mixed with Munich’s Duke gin, or ask one of the friendly bartenders to dream up a cocktail just for you. The art of simplicity guides the neo-Bavarian kitchen at Broeding — which means there’s only one tasting menu offered per night, available in five or six courses. (Score a deal from 6 to 7 p.m., when an abbreviated three-course option is just €45.) To ensure the vegetables are as local, seasonal and organic as possible, they’re grown in the restaurant’s own greenhouses. From the outside, this museum resembles an enormous metallic bowl, opposite Munich’s expansive Olympic Park. Inside, car geeks can learn all about one of Germany’s most iconic brands through a series of themed exhibits. Production vehicles and racing cars are on display, along with motorbikes and aircraft engines from BMW’s early years. Munich’s Maxvorstadt neighbourhood is known as the Kunstareal (art district). Here, you’ll find the Pinakothek der Moderne, one of the world’s largest troves of modern art. It covers four museums under one umbrella: Sammlung Moderne Kunst (painting, sculpture and photography), Die Neue Sammlung (industrial design), Architekturmuseum der TU München (architectural works) and Staatliche Graphische Sammlung München (drawings and prints). Opened in 1901 on the River Isar, Mueller’sches Volksbad was intended as a public pool for the poor — though you wouldn’t guess this humble intention from the ornate art-deco design. Year-round, you can swim in the warm-water pool under the domed ceiling, relax in the saunas or Roman-inspired steam bath, and soak up the bathing culture. What’s better than eating local? Learning to cook local with a top chef. Michelin-starred Alfons Schuhbeck runs classes in the kitchens of his upscale Munich restaurants, Orlando and Südtiroler Stuben. Sign up for the crash course on Bavarian and South Tyrolean cuisine to learn how to make dumplings light and the coat of a schnitzel crispy. Dedicated bike paths criss-cross the Bavarian capital; follow the trail along the River Isar to ride past Hellabrunn Zoo on your way out of Munich. If you’re feeling energetic, continue toward Lake Starnberg, where King Ludwig II mysteriously drowned in 1886, or to the spa town of Bad Tölz in the foothills of the Alps. If you only know Porsche as a performance sports-car maker, you may be surprised to see all the other sleek products it creates. At this minimalist design shop in its German homeland, you’ll find sporty apparel for men and women, sunglasses and high-end watches. This German department store specializes in a wide range of handcrafted goods, including smartly designed, affordable kitchenware. You’ll also find everything you need for a picnic, such as sourdough bread fresh out of the stone oven, and specialty foods from European monasteries, such as olive oil, forest honey and organic salami. One of the best bottle shops in Germany, Biervana opened in 2014 and proudly stocks only beer — more than 600 different brews at last count. Shelves showcase Bavarian craft producers, such as Orca Brau, Hanscraft and the cheeky Munich Brew Mafia, plus beers from beyond Germany. Right by LMU München university, you’ll find the first branch of Edited to open in the country’s south. The German label hits the trends with fashionable women’s clothing, shoes and accessories, available at fairly accessible price points. There are six collections a year, which means fresh stock every couple of months. A five-minute drive from Munich’s main railway station, München Hauptbahnhof, this centrally located hotel is geared toward the needs of business travellers. There are standard rooms, but those requiring plenty of space can book the 915-square-foot Presidential Suite, which comes with a living room and a meeting table that can seat eight. Old school meets new cool: in a building that once housed a royal telegraph station, you’ll find this 165-room hipster haven. With everything from simple, wood-and-tile “box rooms” to plush suites, young nomads and small families alike can check in here. After a day of cycling through the city (ask at reception about the complimentary bike), guests at this classically elegant property can escape to the garden terrace for dinner or an aperitif. If you can splurge for the two-floor Maisonette Suite, you can even chill out on your own personal rooftop terrace. Before checking in, guests are invited to call or e-mail a host at this 19-room property, and concierge service is ready to help 24/7. Also available around the clock is the open-concept Gaggenau kitchen, where snacks and beverages are on the house. You can even ask a resident chef to prepare a meal anytime. Travellers valuing convenience will find it at this contemporary hotel: The gym is open at all hours every day, snacks are available at the 24/7 grab-and-go pantry, and of course the location — just opposite München Hauptbahnhof — couldn’t be more central. This hotel in Fraunhoferstraße is all about the view, thanks to sunny penthouse studios with private terraces — on clear days you can see the Alps. Head up to the rooftop bar for a house spin on the mint julep with homemade apple cinnamon marmalade. The S-Bahn, a rapid transport system, links travellers from Munich Airport (MUC) to the city’s main railway station (München Hauptbahnhof) and other downtown locations. The trains run on two lines, the S1 and S8, both taking about 40 minutes, with tickets costing €13. You can also board an express bus, €10.50, which covers the distance in about 45 minutes. A metered cab will get you downtown in around 45 minutes, depending on traffic, for about €60. Munich has an extensive bus, U-Bahn and S-Bahn network, divided into four zones, with rates depending on the length of the journey. A one-way fare in a single zone is €2.90. Frequent riders can buy a day pass (from €6.70) or three-day ticket (€16.90). Group tickets and passes, valid by the week or month, are also available. Call for a cab, or order an Uber: Hailing taxis in Munich isn’t as easy as in North America, since they tend to wait at stands between fares. Registering online for Call a Bike (€3) grants you access to short-term rental bicycles from more than 90 stations around Munich. Riding for up to 30 minutes costs €1; the 24-hour rate is €15. An atelier hop through Munich and Vienna alongside Canada’s craftiest curator. Inside the porcelain manufactory at Munich’s Nymphenburg Palace, 75 artisans handcraft statues and dinnerware much as they did when the studio opened nearly 300 years ago. With intent eyes and nimble fingers, they ply clay on pottery wheels powered by a nearby brook, while sitting next to giant windows, daylight illuminating each flower, feather and bow. The manufactory is just one of several generations-old workshops dotted around Munich and Vienna that meticulously adhere to techniques that predate modern technology. My guide on the journey is curator and furniture dealer Stephan Weishaupt, owner of Avenue Road, which has showrooms in Toronto, Vancouver and New York. 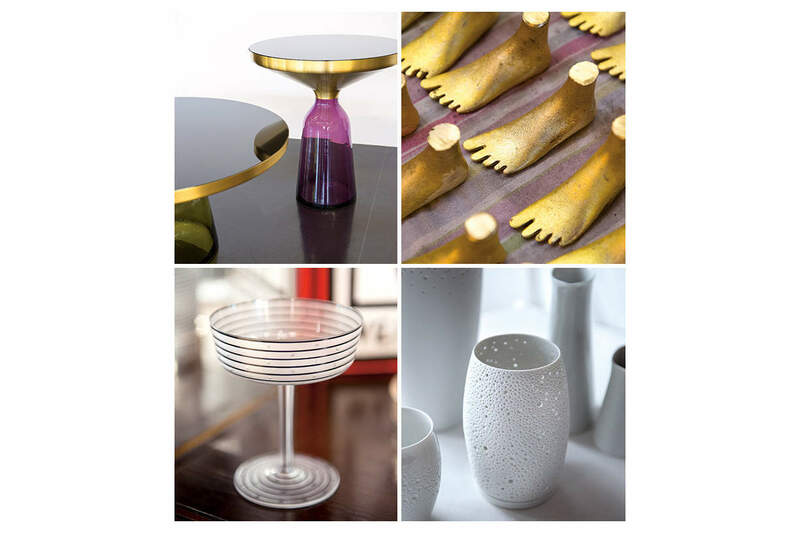 Born and raised in Munich, he visits the region almost monthly to source porcelain, brass, upholstery and crystal. Many of the workshops are run by the fifth or sixth generation of the same family, Weishaupt explains. “They have spent hundreds of years not only developing but also perfecting their techniques,” he says. “First, for royalty such as the Hapsburgs and the Wittelsbachs, now for global markets.” Here, four of his favourite workshops. The Bell Table is an uncanny creation that balances a hulking, heavy disc of metal on a delicate tower of glass. Designed in 2012 by Munich’s Sebastian Herkner, it has to be put together in a very precise way, lest the whole thing topple over and smash. The table is a hot item at Weishaupt’s Avenue Road, and a very important part of it is produced at Poschinger – a 450-year-old glass-blowing studio in a great big wood-roofed barn in the Bavarian Alps. At the centre of the space is a massive brick oven with black iron doors. Its importance is clear: It’s elevated on a platform, as if on a stage in a playhouse. Fittingly, it is also quite dramatic. When the doors are open, its maw glows a violent red, with lava-like glass bubbling away at 1,200 degrees Celsius. All around the oven, a half-dozen men spin and blow the glass at the end of 2.5-metre-long steel tubes as a terrier named Linus runs around their feet. They blow the glass into moulds carved from beech, a wood that can withstand the heat, and use wooden paddles to smooth out imperfections. So not only do they need a strong set of lungs, the men must also rely on deft hands to ensure that every facet is exactly straight, smooth and level. Carl Auböck II is one of midcentury-modern design’s best-kept secrets. A student of the Bauhaus, he took over his father’s metal shop in 1929 and immediately moved it toward the esthetic of his time. Then Carl III befriended Charles and Ray Eames and collaborated with the fashion house Hermès, architect Josef Frank and furniture designer George Nelson. The history is evident in the studio, a squat, peach-coloured coach house in the middle of Vienna. Outside, intricate vases, candleholders and wineglasses adorn the black-trim sash windows. Inside, the stone stairs have been so well-trod they appear soft, concave in the middle like melting butter. Throughout, machines with brass engraving blades – they look older than many of the artisans – shed fine, metallic dust all over the floor like sparkles from a gilded fairy. Munich’s Nymphenburg Palace has Versailles-like gardens and a Hall of Mirrors so glitz-filled that it would make Marie Antoinette jealous. Founded in 1747, its porcelain manufactory is housed in a small canary-yellow cottage facing a giant lawn and surrounded by manicured hedges. Skirting the building, a brook flows through a turbine that has powered the pottery wheels since long before sustainable energy was a trend. The turbine is only part of the time-honoured way that the porcelain is produced. The raw clay is mixed on site, then fermented in vats, almost like wine, for two years to develop the right consistency, colour and texture. After the porcelain is perfect, it’s carefully worked over by artisans. Although rock-hard once fired in an oven, the raw material, in inexperienced hands, crumbles like feta cheese.